I have been making my way through C.L Taylor’s books after seeing so many of them around. I thought it was time to get around to them. I’m pleased I have because I’ve found another brilliant writer of thrillers! 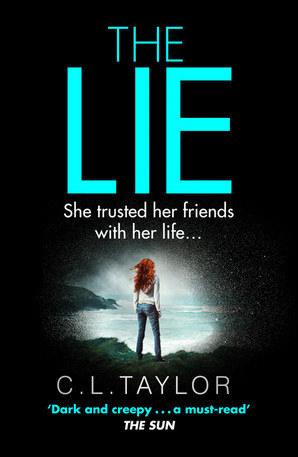 Whilst The Lie isn’t my favourite book by C.L Taylor, it still didn’t take me long to read. It still made my skin crawl a little bit which I’m coming to expect from a C.L Taylor book! The Lie centres around a character we believe is called Jane. We find out that ‘Jane’ is her new identity. Five years previously, Jane was Emma and she went to Nepal with her friends to cheer up one of her friends. It was definitely not a relaxing holiday and Emma returned needing to change her name. We know from the start that something bad happened to the girls, but the terrible details start to unfold slowly as you read her story. ‘Jane’ feels like she’s moving on with her life with a job she loves and a relationship that’s developing nicely. However, she soon finds out that someone knows about the past and is going to make sure that she can’t forget it! I thought The Lie was an incredibly dark read with some awful characters. Awful characters that I loved to read about though. I loved how the story unfolded through flashbacks of 5 years ago and present time. It added to the tension of the story. I have to admit that most of the chapters set in Nepal really were menacing. I found them tricky to read at some points, especially when they were becoming increasingly more violent. It became so tense and the cracks in the friendships really started to show. That’s when I began to dislike characters more and more, but it didn’t affect my enjoyment of the story. I was also intrigued by Emma/Jane’s present day story. I always try and work out who is behind everything during these sorts of stories, but I didn’t quite get there, although I began to have some suspicions. Once again, C.L Taylor does weave a wonderful plot. I think you’ll enjoy this thriller if you enjoy intense, menacing and uncomfortable thrillers! Whilst it wasn’t my favourite book from C.L Taylor, I still tore through it desperate to find out what was happening!